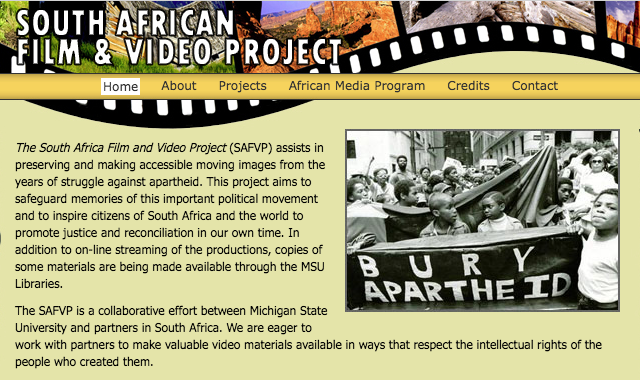 The South African Film & Video Project is one of the resources available in the African Media Program. The African Media Program (AMP) offers an online, comprehensive database of films, videos, and other audio-visual materials concerning Africa as well as education services about African media. The site hosts a comprehensive list of educational film resources that address African history, culture, and politics. Each resource is accompanied with helpful notes and annotations, including a plot synopsis, subject lists, and audience appropriateness. AMP also gives information about where copies of the resource can be found. For some resources, additional information about the film is given, including misrepresentations of African subjects/ideas in the film, filmmakers’ bias, or contradictory perspectives on the same event. The AMP archive was created to help educators evaluate film materials for their educational value in the teaching of African history, culture, and politics.